Define a fallback state of your project in the form of a poster image or of your own artwork. When visitors view your content in a legacy web browser, the poster image is displayed. In the Timeline panel, position the Playhead at the end state of all animations. In the Elements panel, select the Stage element. In the Properties panel, click the Capture Stage As Poster Image button (camera icon). 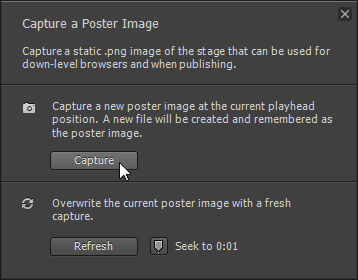 In the Capture a Poster Image dialog box that appears, click Capture. In the Properties panel, click the Edit button for the Down-level Stage property. Click the Insert button. The image that you captured appears on the down-level stage. To use your own artwork, drag the image from the Library panel to the down-level stage. Return to the main stage by clicking the Stage breadcrumb at the top of the preview window.